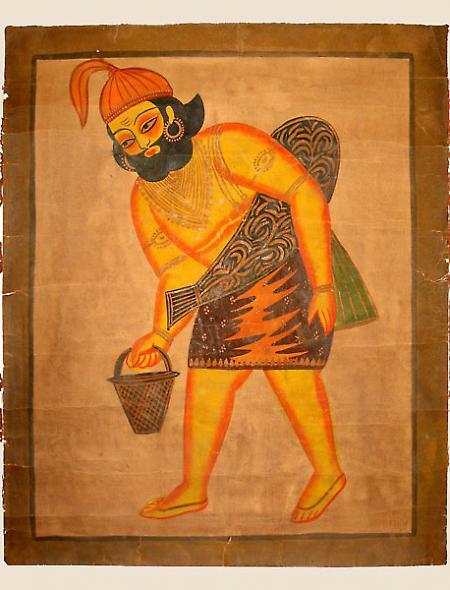 The Kalighat paintings were very popular form of art in the past. The popularity can be judged from the fact that they were they were replicated by the German lithography on glazed paper and inundated which resulted in the demise of this art form. There aren't any practioners of the traditional art form. These miniature folk paintings were made on crude hand made papers. The Kalighat paintings were basically line drawings, the outlines of which were made in bold single stroke with a brush. The art form depicted day to day events of everyday life. The paintings were caricature of the events which also included widespread sayings and the proverbs. The paintings used to be an important media and a pictogram of revolt. It was also a voice against the evils of the society.